Until we see you again, BYGGYZ Beef. 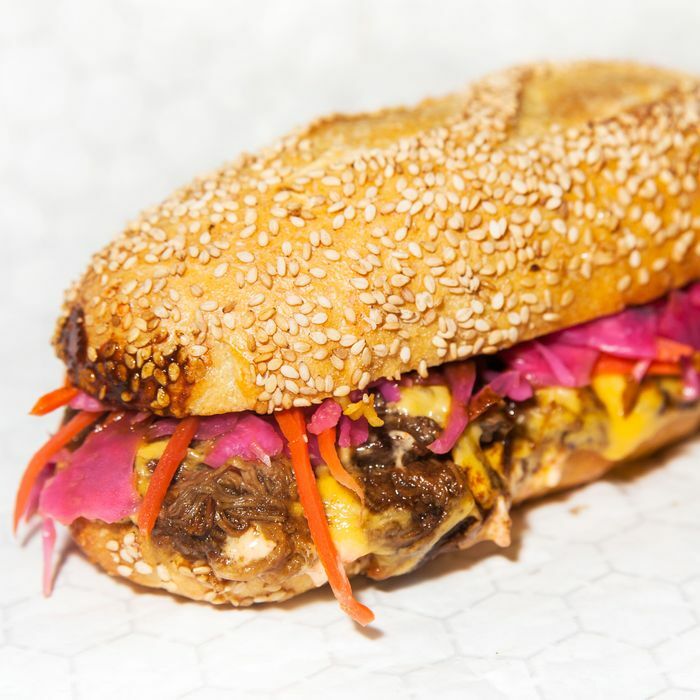 After six years of preproduction and ten months of business, the briefly lived but acclaimed Lower East Side sandwich shop BYGGYZ will bow out July 1. For now, fans of the sometimes offbeat and always brazen creations of Dewey Dufresne can take solace in the news that BYGGYZ will soldier on Smorgasburg East River Park on Saturdays, as well as join the lineup soon at Smorgasburg in Prospect Park. At both Smorgasburg locations, the focus is the Benny, a pastrami number not available at BYGGYZ. It’s made with thick slices of the smoked meat, plus pickled vegetables, mango mustard, and more of that kimchee-cheese spread, all on grilled cornmeal focaccia. The sandwich project is in search of investors for expansion for its next phase, a rep says, and will use the market as a testing ground for new drinks and sandwiches, with wraps and gluten-free options in the pipeline.